The Boker Plus LRF designed by Kansei Matsuno has a simple and refined Japanese aesthetic that is perfect for this modern Gentleman's every day carry folder. The slim, lightweight design carries easily in any environment and with dual top flippers, ball bearing pivot and steel liner lock the knife can be operated to suit the scenario. This version has Black G10 handle scales and VG-10 stainless steel blade. 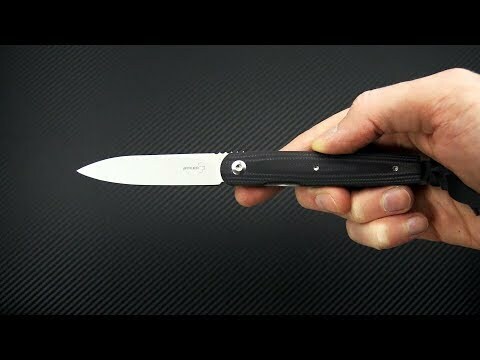 Handle: Simple and slim, the LRF is built on a semi-open back, steel liner construction with Black G10 handle scales. The liner lock mechanism is smooth and reliable and a lanyard loop at the pommel is equipped with a short, leather lanyard to facilitate drawing from the pocket. A partial steel backspacer protects the edge from other items carried in the same pocket.